Vote for Bob is a campaign run by the RSPB. It’s all about a red squirrel called Bob who is eager to give nature a vote. It is very important to stand up for nature and give it a vote for many reasons, one example is that we need to protect and preserve it for the future and for future generations to enjoy. Since 1977 house sparrow populations have declined by 64%. 60% of plants and animals surveyed in the UK are declining. Hedgehog numbers have halved in the past 25 years. 97% of our flower-rich meadows have vanished. Our bumblebees, butterflies and other vital insects are disappearing with them. Scientists predict by 2020 there will be fewer then 1000 pairs of turtle doves. Even though I’ve only been alive for 15 years I have started to see and notice that certain species are declining. For example over the past few years I’ve seen less and less kestrels, there aren’t as many hedgehogs visiting my garden like in past years, I used to have lots of sparrows visiting my garden and now I only get a few and the number of bees and wasps I see have declined too. The Vote for Bob campaign includes asking every party leader what they intend to do to look after our wildlife, countryside and wild places. His aim is to make sure that nature is back on our politicians’ agendas. 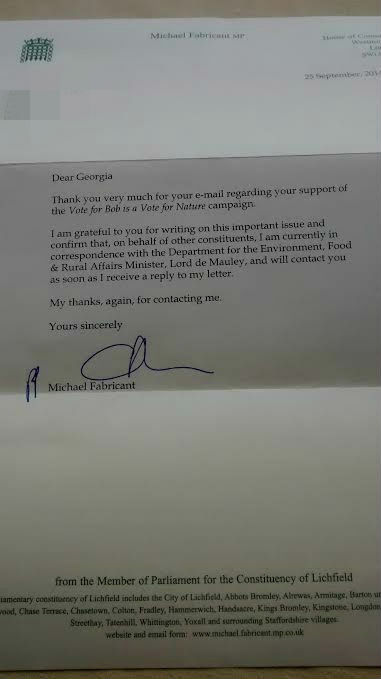 After visiting the website and ‘Voting for Bob’ I also sent my local MP an email directly and asked him to make a commitment to raise nature up the political agenda. After sending the email I didn’t really expect a reply back but I was very pleased when I got home from school yesterday and discovered that he had written me a response about what he had done. Here’s a photo of it. I am very pleased about my reply and that my local MP, Michael Fabricant, has taken the the matter seriously and done something too. 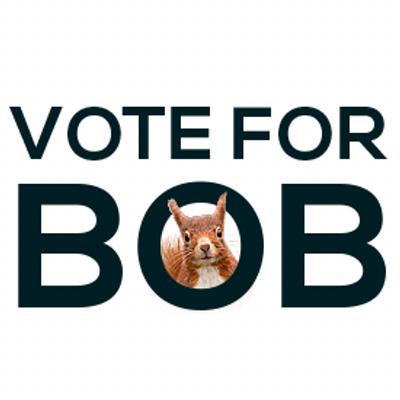 If you’d like to get involved and make a difference you can visit the Vote for Bob website here – https://www.voteforbob.co.uk/ where you can ‘Vote for Bob’, send an email to your local MP, get a free campaign pack and much more! Previous PostThieving rat!Next PostAll sett for a ‘Wild’ Saturday! I’ve voted for Bob and also received a response from my MP. I wore my Vote for Bob tshirt at Alton Towers last week so hopefully lots of people saw it and will have googled Bob! This is brilliant Georgia. Well done for telling us all about it. Have you heard about Grow Wild UK ? I wrote about it yesterday (10th November) It’s a scheme to provide free wildflower seeds for unloved places. Kew Gardens and the Big Lottery Fund want to get young people involved in this project over the next few years so that should be good for insects, birds and small mammals too.